Steven Curtis Chapman's story is one of utter heartbreak, as well as an inspiring faith, that opens up his faith and music in a powerful way. You've no doubt heard his music, but have you heard his story? Steven Curtis Chapman's new autobiography opens up the highs and lows of a life spent creating powerful worship music, and is an inspiring read for anyone looking for a story of redemption, of loss, hope and finding inspiration to lift your voice to God in praise. No matter what. Between Heaven And The Real World shows you the faith behind the music, and will leave you hopeful of the ways God moves in each and every life. Just as his music has changed hearts, so too will his life. From his troublesome family life as a child, right up to losing his 5 year old daughter in a tragic accident, Steven Curtis Chapman writes with searing honesty and insight everything that has happened in his life. Nothing is hidden, regardless how painful or difficult. His personal journey of faith is offered up as a testament to his faith, a declaration of God's faithfulness in everything. Be moved, and be inspired, by the story of one of the leading worship leaders of today, and discover the humility and complete trust in God that has kept his eyes on God through the extreme highs, and shattering depths. Discover all that can happen in a single life when you trust in God completely. 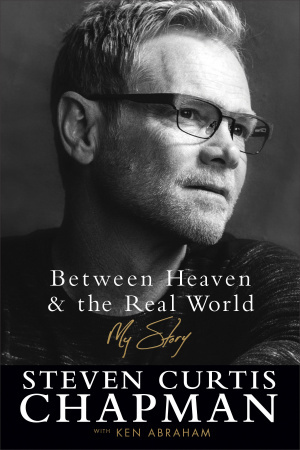 Between Heaven and the Real World by Steven Curtis Chapman was published by Fleming H. Revell Company in April 2017 and is our 50324th best seller. The ISBN for Between Heaven and the Real World is 9780800726881. Be the first to review Between Heaven and the Real World! Got a question? No problem! Just click here to ask us about Between Heaven and the Real World. From childhood, music has been both a refuge and a release for Steven. With humour and humility, he offers a backstage look at his early days on the road and his wild ride to the top of the charts. Discover the stories behind some of his best-loved songs. Walk with him as he and his wife, Mary Beth, navigate the joys and trials of marriage and family. Cheer for his return to the stage after doubting he could ever sing again. And SEE God in the aftermath of the tragic death of their five-year-old daughter Maria. 25. Does God Really Have a Big, Big House?